For larger image click on pictures. Two cabins similarly designed and under one roof. Side by Side. Each unit is private, has two bedrooms and sleeps 4-6 people. Our former home is now a 2 bedroom rental and we affectionately call it "The Penthouse". It sits up high with windows facing the lake along the entire front of the building. This is the only unit to boast a microwave and TV as well as a bathtub and shower. It also has a nice back yard for a comfortable picnic with family and friends. Sleeps up to 6 people. The lower level, formerly the bar, is not part of the rental but a storage area. Originally built in the late 1920's as an extra kitchen and dining area for the family that homesteaded the land. 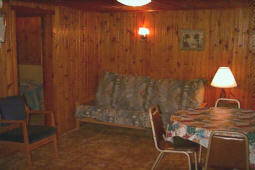 Later it was made into a cabin and just recently remodeled. This two bedroom cabin sleeps 4-6 people. 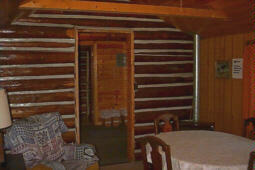 Built in the late 'teens' this cedar log cabin was the original home of the Beebe Family. 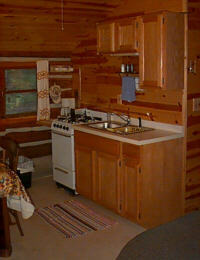 Remodeled in 1993, this lovely three bedroom cabin sleeps 6-8 people. Separate cabins assure privacy. Each has a view of the lake, bathroom with shower, and is fully equipped for housekeeping - stoves, dishes, utensils, pots, refrigerator, skillets, toaster, Mr. Coffee, barbeque grill, etc. Bed linens and blankets are furnished, but guests are asked to bring their own towels for kitchen and bath. The rooms are comfortable without being ostentatious. A credit card (Visa/MasterCard) number with current expiration date will hold your reservation. No charges will be placed on your credit card unless you are a no show or cancel without proper notification. See cancellation policy. 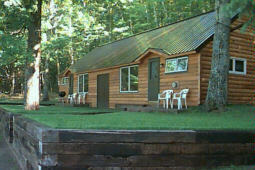 A $200.00/cabin/week deposit is acceptable if received by us within 7 days of booking a cabin. If not received with 7 days, the cabin will be released for rebooking. A $100.00/cabin/weekend is acceptable as stated above. If reservation is less than 2 weeks away, credit card hold is mandatory. Payment of cabin fee is expected at least 24 hours prior to departure. Reservations must be 2 nights or more. One month notice of cancellation or we keep your deposit. One month notice of cancellation or we charge your credit card $200.00. Absolutely no pets allowed including day time visitors. We regret not welcoming your pet. However, due to irresponsible pet care in the past (cabin damage, ground damage, droppings) as well as guest allergies, we will not reverse this policy for anyone. If you have to bring your pets along we can make arrangements for boarding your pet for the week at Northland Veterinary Services, Iron River.